Prudent use of energy resources is the key to producing thermally efficient buildings and in this case, swimming pools. It is more than simply providing extra heating or refrigeration; it is primarily the need to achieve total energy balance. For example, an Expanded Polystyrene Styrofoam (EPS) wall need only be 1/20 the thickness of a brick wall to achieve the same degree of insulation. However, a brick wall is 2,000 times as heavy, and requires 600 times as much energy to produce. While it is not suggested that polystyrene will replace the brick, it highlights how EPS used in conjunction with traditional materials can be used to provide more cost efficient building methods…and better use of energy resources. EPS is a product that is not only compatible with all building materials, but offers versatility, design, ease of construction and cost advantages that the other materials cannot. The aware architect, engineer, and builder using EPS in practical ways, has unlimited scope for designing more thermally efficient pools and at the same time maintain energy balance. Some states even offer governmental rebates for using products that save energy. That can be a great promotional tool for a builder looking to appeal to environmentally conscientious consumers or homeowners who want to save money on their heating costs. Expanded polystyrene is a lightweight cellular plastic material consisting of fine spherical shaped particles that are comprised of 78% air; this air is trapped within a number of closed cells in each particle. Blocks of expanded polystyrene are made by re-softening the expanded particles in a block mold with steam until they fuse together. Because stabilized air is such a good insulator, the resultant product is extremely effective as thermal insulation material. Thermal performance of material is measured in terms of its resistance to the flow of heat which is expressed in R values, the higher the number, the better the insulation. The difference is that you’ve literally installed an R-20 insulated value wall in the ground. Thermal Insulation: Because of the insulating properties of the therma-foam pool wall, the cold ground does not rob the pool of its heat; heat loss from the water to the surrounding ground is reduced and the pool is therefore warmer than any other type of pool structure. Flexibility copes with movement and stress: The therma-foam pool wall system has been designed to withstand free active earth movement and other pressures. Cost effective: The only pool system that pays for itself when heated. Non-corrosive: Utilizes essentially inert materials, which will not succumb to corrosion in the presence of moisture or acidic soils. We are committed to offering Green Insulation Products and other energy efficient products that will help reduce dependency upon foreign energy products and reduce the drain on natural resources. For that reason we also offer the floor barrier insulation product to use under concrete for a better insulated pool. Reflective Foil Foam Radiant Barriers Stop up to 97% of Radiant Energy Transfer and much more. It's an ALL-IN-ONE under concrete EPS insulation product used under concrete slab as insulation by providing vapor and moisture barrier protection in combination with insulation from conduction. It works better, is cost effective, and easy to use. It is a vapor/moisture/insulator and radon protector. 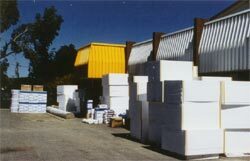 The Barrier is a rolled foam board insulation of extruded expanded flexible recycled polystyrene foam (XPS). The floor barrier is a 100% vapor, water, moisture barrier as well as a thermal break of conductive heat transfer and radon resistor all in one product. It uses an extruded XPS with laminated heavy-duty polyethylene film on both sides: it stops 100% of any and all forms of moisture transfer, try that with rigid foam sheets. The multi-layer product's make up is an effective radon retarder and when proper sealing and gas infiltration procedures are used, the insulation floor barrier blocks the radon transmission. Radon gas is the 2nd leading cause of Lung Cancer and builders should be aware that this product is a RADON Protector for their customers. Termites also are deterred by the naturally occurring boron in the Barrier. Roll sizes are 4 x 60 = 240 sq ft per roll. In addition to the high performance characteristics and standards the Barrier is setting for the underground insulation/under concrete insulation market, it has the patented self-sealing double faced taped edges.